Προσθέστε αυτοκόλλητα στην επιφάνεια εργασίας σας και να δημιουργήσετε υπενθυμίσεις για επερχόμενες εκδηλώσεις σας! 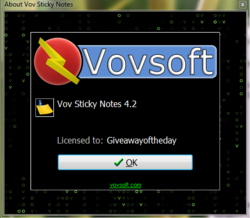 Vov Sticky Notes 4.2 ήταν διαθέσιμο ως προσφορά στις 20 Απριλίου 2018! Για πολλούς ανθρώπους, η επιφάνεια εργασίας είναι απλά το μέρος όπου συντομεύσεις και τα εικονίδια που βρίσκονται, χωρίς καμία πραγματική λειτουργικότητα. Παρ ' όλα αυτά, μπορείτε να επωφεληθείτε από όλα τον κενό χώρο στην επιφάνεια εργασίας σας, προσθέτοντας post-it, και Vov Κολλώδεις Σημειώσεις είναι μία από τις εφαρμογές που μπορεί να σας βοηθήσει να το κάνουμε αυτό. Μόλις το εγκαταστήσετε στον ΥΠΟΛΟΓΙΣΤΉ σας, η εφαρμογή μεταβαίνει αυτόματα στο δίσκο του συστήματος, και μπορείτε να κάντε δεξί κλικ στο εικονίδιο, όταν θέλετε να δημιουργήσετε μια νέα σημείωση. Ουσιαστικά ανοίγει ένα παράθυρο με δυνατότητα αλλαγής μεγέθους, όπου μπορείτε να επικολλήσετε κείμενο ή να αρχίσετε να πληκτρολογείτε κάποια από τα σημαντικά καθήκοντα. Μια άλλη χρήσιμη λειτουργία του Vov Κολλώδεις Σημειώσεις είναι ότι μπορείτε να δημιουργήσετε υπενθυμίσεις που θα εμφανίζονται σε τακτική βάση. Χρειάζεται μόνο να επιλέξετε το διάστημα συχνότητας και, στη συνέχεια, πληκτρολογήστε ένα κατάλληλο μήνυμα. Generate, edit, convert and protect PDF files. One has to ask 'Why?' when there is a perfectly usable service like this built into Windows. Can't use without a key. Nothing via email or on your site. Please send key asap. Kathy, It's in the 'Readme' file'. The biggest advantage of Vov Sticky Notes over the Windows Sticky Notes is that you can add reminders to these notes. I like that feature and will be using them, mostly for that. A disadvantage is that they do not allow hyperlinks, whereas the Windows SNs do. So, when I need a note with a URL I will still be using Windows for convenience (read: lazy -- as I can always copy and paste from Vov to the browser URL bar). Other than the reminder feature, I don't see a big improvement on the free version that comes with your Windows program. The biggest advantage of Vov Sticky Notes over the Windows Sticky Notes is that you can add reminders to these notes. I like that feature and will be using them, mostly for that. A disadvantage is that they do not allow hyperlinks, whereas the Windows SNs do. 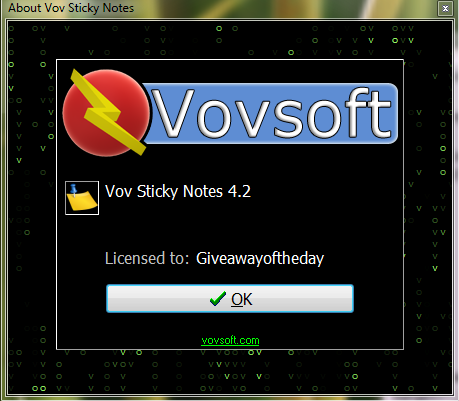 So, when I need a note with a URL I will still be using Windows for convenience (read: lazy -- as I can always copy and paste from Vov to the browser URL bar). Other than the reminder feature, I don't see a big improvement on the free version that comes with your Windows program. A. Allow it to Drag and drop images which auto resize to fit the note's size. Sometimes you have an image you'd like to keep in a window on your desktop for many reasons. No utility does exactly that. 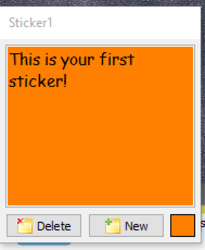 Sure you can display images in a window. Pictus is great for displaying an image in a window but that's it, no frills. However, no utility will remember an image's position, size, & boot with windows. Allow it to run animated gifs as images too. That's great for cartoons and such. There is a world of graphics artists and designers out there. Notes alone are great but "a picture is worth a thousand words". Pinning an image of a current project on your desktop is a valuable tool. Every time your system boots you get a fresh look at it and you get improvement ideas ! B. Similar to above: Drag and drop MP4s in a loop. So many people love & enjoy watching goofy videos. To have your favorite loop running on the desktop would be fun. Give each window a mute button as some videos have sound. 2. 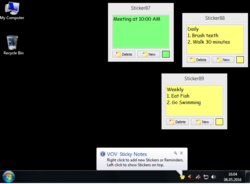 Windows makes the notes look like actual sticky notes. Do exactly that just with more functionality !! Remove your borders. They look way too Windows XP as the look is very dated. Windows has a + and X. Hey, they established a convention for this functionality so go with it. It looks better too. Place it in the header like they did. However, in the header add Font, font size, Bold and italic. Windows can not change font & font size and it's a pain. There are hot keys for that but it's a hidden functionality and few if any folks know about that. Also, use the windows convention for resize drag in lower right corner.